"Don Peyote," about a stoner lapsing into apocalyptic reveries in the lead-up to his wedding, is the worst American film I've seen this year. 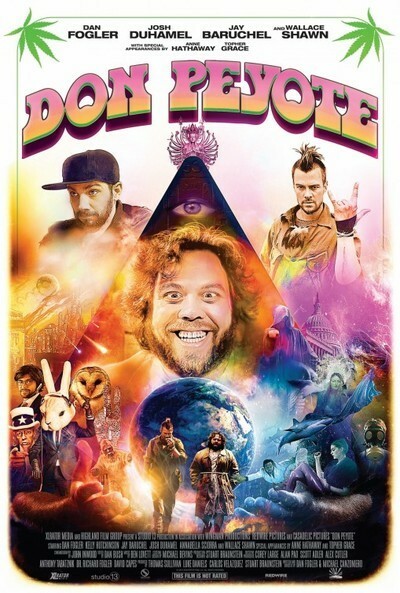 Co-written and co-directed by its leading man Dan Fogler (with Michael Canzoniero sharing half the blame) it's the sort of picture that limps toward theatrical distribution based on industry connections rather than on any innate artistic virtue or entertainment value. Fogler, a character actor best known for his guest stints on "Hannibal," in "Europa Report" and in "Balls of Fury," where he played ping-pong champ Randy Daytona, stars as the film's erstwhile hero, Warren Allman. Warren's a jobless stoner whose impending wedding to a Judd Apatow-esque responsible drag (Kelly Hutchinson) is derailed after a chance encounter with a homeless man blabbing doomsday slogans. He becomes obsessed with the encounter, plunges deeper into drugs, falls apart in paranoia, and sidetracks himself in the run-up to his nuptials by fixating on the idea of making documentary warning of the world's end. There might be a compelling film in this story—most likely a drama like "Take Shelter" about a man's mental collapse, or perhaps a very black and very incisive comedy—but "Don Peyote" isn't it. Despite its charmingly low-tech special effects (including a tidal wave drowning Manhattan) and a couple of out-of-nowhere musical numbers, it seems less cheeky than grossly indulgent, like a notebook full of ideas for a film that for whatever reason never took shape but were enshrined onscreen in their hallucinated magnificence anyway. "Don Peyote" is packed with recognizable names, including Anne Hathaway, Josh Duhamel, Topher Grace, Annabella Sciorra, Abel Ferrara, Dean Winters and Jay Baruchel, but the very loose dialogue and poorly imagined interactions (which are mostly covered with multiple cameras, in the manner of a wedding or a child's birthday party, rather than truly directed) prevent any of them from creating memorable moments. The best they can do is try, and in most cases fail, to avoid embarrassing themselves. The sound is poor, the editing choppy, the dialogue overly dependent on profanity (and not in that flavorful Mamet way, either) and the star consistently overacts. This is a bad stoner film, a bad romantic comedy, a bad character portrait, and just all-around bad. Avoid, avoid, avoid.